On January 17, 2018, Wednesday, Queen Maxima of The Netherlands opened 2018 Dutch Organic Trade Fair held at IJsselhallen Convention Center in Zwolle, The Netherlands. The fair has more than 350 stands which enable visitors to receive information about new organic products and services. In addition, the trade fair focuses on farmers, food and beverage producers and researchers. Technical innovations in organic agriculture are shown in BioMechaTech hall. What a glamour blast to a food fair, but she looks stunning if I manage to avoid that thought how much she goes over with this stunning state visit look. WOW beautiful colour dress and coat. Love this combination. Nice that she wears green for an "organic" event! She looks stunning, in her over-the -top way. Yes, it's hard to get down on her even when she is totally over-the-top. She seems like such a delightful person. At least this time the enormous brim of her hat turns up and away from her face, and doesn't obstruct her view (or ours, of her)! Darla Leigh, I agree about her hat! And I suspect that people expect her to look slightly outrageous and love her for it. Ich mag Königin Maximas Outfits generell. Sie mögen vielleicht nicht immer hundertprozentig sein, fröhlich und lebensbejahend sind sie auf alle Fälle. Sie spiegeln auch den Charakter ihrer Trägerin wider und das macht diese Garderobe so authentisch. Der Königin der Niederlande macht ihr Job Spaß und deshalb schaue ich ihr so gerne bei der Arbeit zu. Zur Mode: Smaragdgrün und Royalblau gemixt. Seidige und flauschige Stoffe verbinden sich zu einer gekonnten Einheit. Die Modefarbe 'Grünkohl' trägt sie auf dem Kopf und an den Füßen. Sehr passende Farbe für den Anlass. Schönes Make-up und eine elegante Frisur. Well done! Compare with Queen Letizia's outfit for today. The same kind of event and such a different style. Curious. 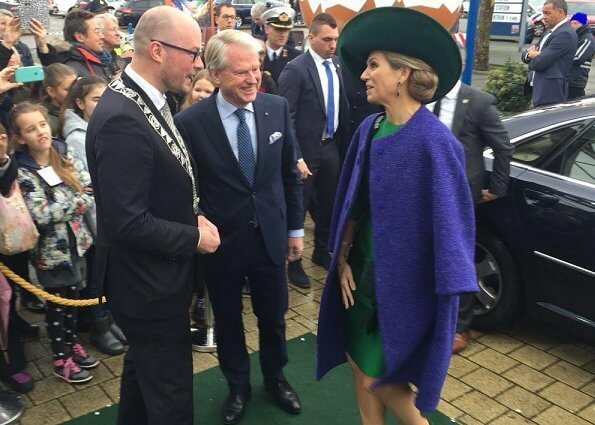 Dit noemen ze nu "overdressed"! Nee, zeker niet. 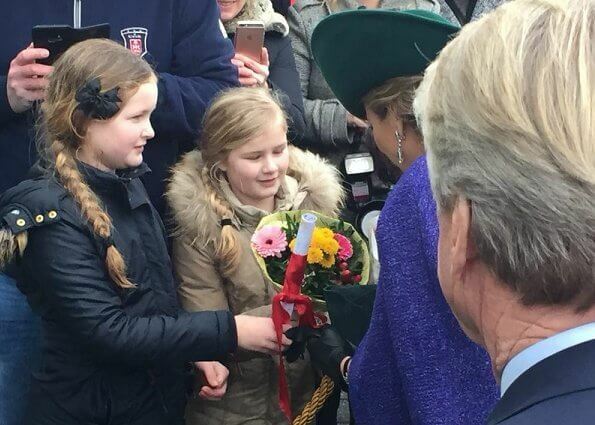 Ze kwam net van een nieuwjaarsbijeenkomst van de buitenlandse vertegenwoordigers in Nederland, dus ze was uitstekend gekleed. Een eenvoudige japon, een keurige bijpassende hoed en handschoenen, nee, dit is zeker niet overdressed. Dit is respect voor de producenten van biologische producten. I like it - it fits her charismatic personality. Not an enormous fan of the two bright colours together but she gets away with it. I can't count how many times I've said "WOW" upon opening a photo of Maxima. I think the whole outfit in shades of rich green is fabulous. The emerald jewelry is wonderful. She's a joy. 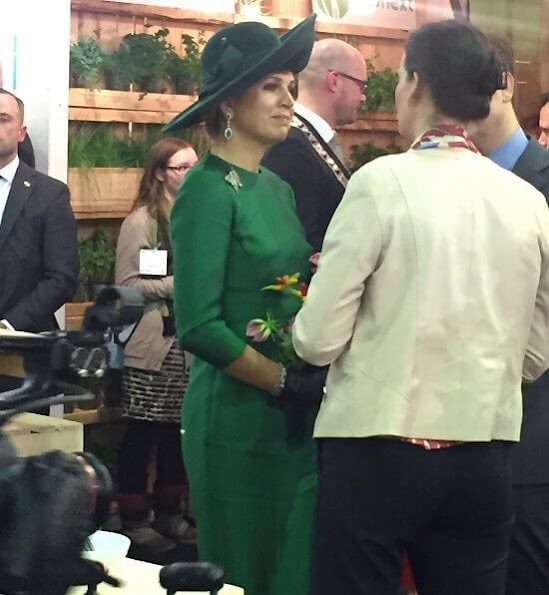 The green, dress, hat and gloves are fabulous. 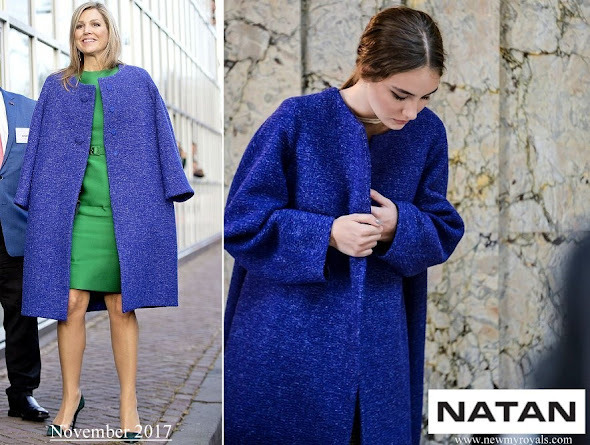 The colour of the coat is beautiful but I wish she'd stick her arms in the sleeves--or just wear a cape! It's Maxima…… but this time too much of everything for a day event! The whole outfit on the litle picture from November 2017 would have been more suitable for this event IMO. No doubt in the crowd as to whom is the queen. Love the combination of colors, and glamour. Of course she is overdressed, but that is what she does. Normally, I´d say no generally to the combination of blue and green. 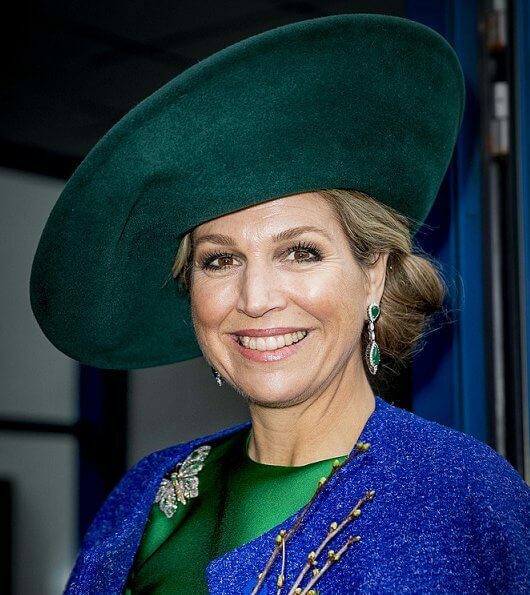 I´m surprised how well it works together here (dress + coat), but the second shade of green in her hat is what ruins it for me. The two greens together are fine, but three bold colours in one outfit (and a dramatic one at that) is too much. Wow! Fashion as powerful endorsement of the event and the topic. Beautiful outfit, though its a day event, so maybe button earrings rather than dangling ones. She's not called Maxima be mistake. As Queen Elizabeth the Queen's mother once said when being accused of being OTT. "people wear there best clothes to meet me the least I can do is wear mine".